Discover the Magic of Reading! 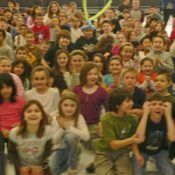 Children smile, laugh and LEARN when Robert McEntee & his incredible reading related illusions appear in “Discover the Magic of Reading!” Elementary School Reading Assembly Program in NY, NJ, CT and beyond. 20 years of mesmerizing performances. Ideal for PARP, Book-fairs, libraries & more! Two versions ideal for grades K-3 and 4-6. Multiple program discounts too. Call or email for the study guide! 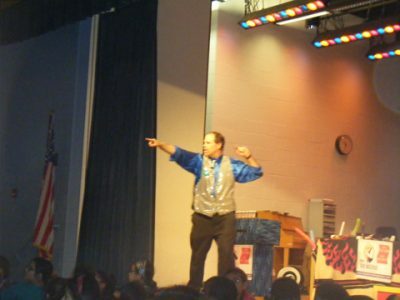 ELEMENTARY SCHOOL READING ASSEMBLY PROGRAM, NY, NJ, CT.
Inspiring students to read more, learn easier & behave better. Ideal PARP Show or Read Across America Program Idea! Float a Student in the Air! Students shout the magic words for the show, “We love to READ!” from a big sign they see, building their excitement for reading and the assembly itself. "Thank you so much for the 3 wonderful performances on Monday. The children have been talking all about it and books have been FLYING out of the library. I was at the evening performance, and TRIED to get close to your table to introduce myself, but you were mobbed by your fans! You did a super job of incorporating in the reading theme, and you mesmerized the kids with the tricks! The younger ones were blown away, and the older kids kept discussing amongst themselves how you did it! Thank you for being the perfect kick off for our PARP month." "The program was used to kick off PARP. The students were motivated and enthusiastic about reading. The reading connection was made over & over for the students. Highly recommended!" 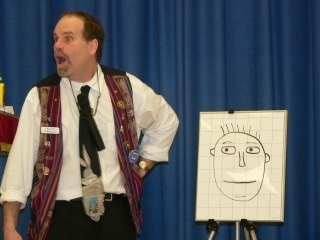 "Magic Bob related his entire performance to reading and how it will positively affect your entire life! The children had a marvelous time. The teachers thought the program was outstanding. Thank you!" Students focus on a large spinning spiral afterwards they are amazed to see someone’s head visually grow much bigger and then smaller! The science behind the optical illusion is explained, that the eye muscles became fatigued when looking at the spiral and overcompensate when relaxing and looking at something else. I explain that reading exercises the mind AND the eye muscles. Speed and comprehension increases with practice. For older grades some simple eye exercises are taught. Through this Elementary School Assembly Program, Students see that reading is fun! Magical books are used in the show with things popping out of them and words and pictures magically appearing. Through exaggeration students see that reading is fun, reading makes them smarter and reading improves their imagination, and often what’s vividly imagined comes true! Therefore vividly picturing themselves doing well on a test, in sports, etc. can improve results. Grant & funding eligible, such as NY BOCES. Make your PARP program unforgettable with an incredible reading incentive or reward: Saw the Principal (or teacher etc) “in half’ or make them magically appear! Your school will LOVE the program or it’s FREE! Call 631-757-4206 or email Robert@SchoolAssemblyMagic.com for customized details!